Google began deploying the Play Store to Chrome OS in 2016, and that was after several years of testing various app emulators. Ahead of Apple's education-focused event on Tuesday, where it will likely debut a cheaper iPad, Acer has announced its own low-priced tablet, and it's the first one to run Chrome OS. You get a browser and lots of Android apps. So far, Chrome OS has pretty much been limited to laptop-style devices, though Google has previously told users to expect tablets running Chrome OS at some point. It costs $329 and will arrive in April, though you should be able to buy one even if you aren't a K-12 student. The Chromebook Tab 10 is designed for collaboration, while Acer notes a portable design with a textured back in cobalt blue. Like other Chromebooks today, it features 4GB of RAM and 32GB of storage with a microSD card slot for expansion. And a microphone, headphone jack, and more speakers on the other side. The Acer Chromebook Tab 10 provides long battery life of up to 9 hours - enough for 1:1 programs where students use them throughout their school day, as well as at home for projects. This is the first Chrome OS tab but won't be the last. Acer's Chromebook Tab 10 preview page is light on hardware specs, but Jacob Kastrenakes at The Verge says the machine has the same Rockchip OP1 ARM SoC found in some Samsung Chromebooks, along with 4 GB of memory and 32 GB of onboard storage. That will nearly certainly be competitive with whatever price point Apple chooses for this rumored low-priced iPad, so Google and Acer are looking to take the fight to Apple before it even gets the chance to announce what it has in store for the classroom. Acer and Google will also be including Augmented Reality support soon through Google Expeditions - though no mention of ARCore has been made...yet. 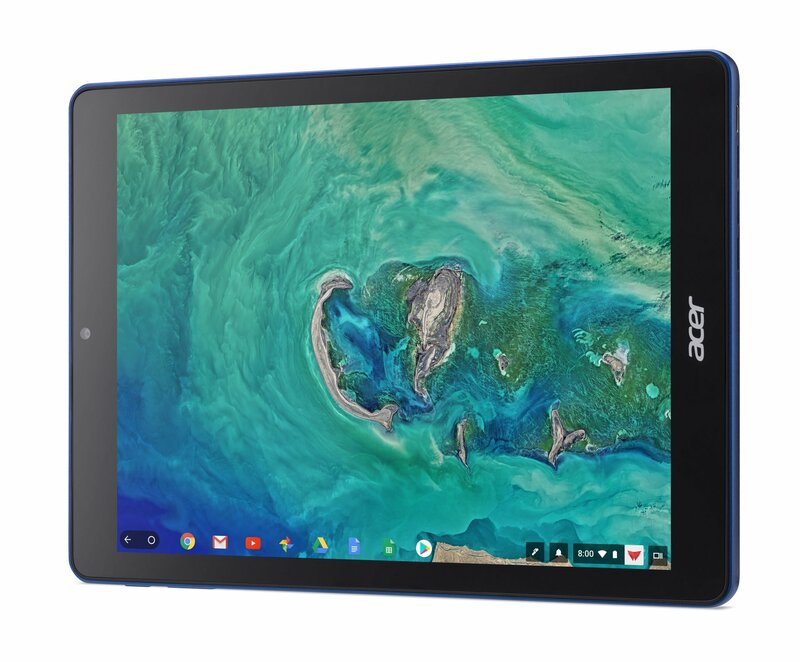 According to Google, the Acer Chromebook Tab 10 is an education tablet that gives schools the easy management and shareability of Chromebook laptops.